At hearings in the House in 2011 over legislation that will prevent the EPA from regulating CO2, Freshman Republican Morgan Griffith asked very specific questions to so-called climate scientists the Democrats brought in to bolster their case. The results were they evaded his questions. Here I will take a closer look at what Congressman Griffith dealt with and why this evasion is all too common. Environmentalists predicted large numbers of killer hurricanes are coming after 2005 when Katrina wrecked New Orleans. What they got was a record low number of hurricanes and zero that made landfall in the US in 2010. What do they do? Run back and revise their computer models now claiming the lack of hurricanes all the sudden is caused by global warming and they are coming back even worse sometime in the future. Let me understand this. Too many hurricanes and stronger hurricanes is proof of global warming. The complete opposite is also proof of global warming. What am I missing here? They claim global warming is here only to see record cold in many parts of the world over the last three years. This included killing zoo animals in Northern Mexico and the loss of 16 percent of their corn crop and massive freeze damage to winter veggies in Mexico, Florida, and Texas all at once. (Winter/spring 2010-11.) This was the worse freeze in Mexico in over 60 years dropping to a low of 9 degrees F. That's in Mexico! Now because "global warming" has become so politically discredited, they now resort to calling it "climate change" to "carbon pollution." It's an absolute fact we have climate change, have had it for 4.5 billion years, and have written records on it going back centuries. Climate change will continue because the climate has never been static to begin with and is a normal facet of the environment that drives evolution. It's in the historical record and there's plenty research that debunks modern climate change dogma. The most common cause of death for the bowheads studied by Art and his colleagues was entrapment in the ice as it expanded in autumn. Because the whales followed the ice edge so closely, the location of their fossils indicates the extent to which the ice had previously retreated. By using radiocarbon dating, Art can determine the age of the fossils. 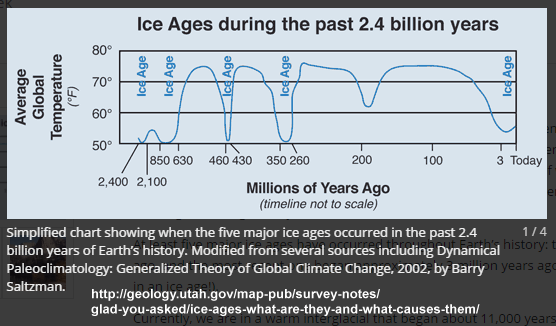 Since fossils are only found where the ice edge once existed, their age tells Art how far the ice extended at a certain point in history....During an open period, whales from both oceans mixed freely and left their fossils throughout the length of the Passage. A study by researchers at the Harvard-Smithsonian Center for Astrophysics including work by included work by David R. Legates, director of the University of Delaware's Center for Climatic Research shows warming much greater than present has occurred in the recent historical past. Modern climate alarmists claim it's warmer than the Little Ice Age that ended around 1850 and we should be alarmed, well, it should be warmer. "Although [Mann's work] is now widely used as proof of anthropogenic global warming, we've become concerned that such an analysis is in direct contradiction to most of the research and written histories available. Our paper shows this contradiction and argues that the results of Mann...are out of step with the preponderance of the evidence." "The nature of the conduct is not stated so that any reasonable person could glean what Dr. Mann did to violate the statute ... The Court ... understands the controversy regarding Dr. Mann's work on the issue of global warming. However, it is not clear what he did that was misleading, false or fraudulent in obtaining funds from the Commonwealth of Virginia." The full article can be read at http://www.bristolwatch.com/news/griffith_climate_scientists.htm.